Indie publisher Digerati and developer Zack Bell Games have announced that upcoming 'splatformer' INK will arrive on Nintendo Switch on 19th June. 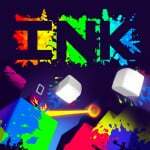 INK is a fast-paced platformer with a bit of a twist - the levels are actually invisible and must be splattered with brightly coloured paint before they can be seen. Players can reveal levels in a variety of ways, such as double-jumping, wall sliding, or squishing an enemy, all of which can create splashes and splodges to brighten up the world around you. Even failing is useful in this game, as when your blocky character dies, it explodes in a shower of colour and paints more of the surrounding area to help you towards your goal. The Nintendo Switch version of the game features all-new local 2-player mode, exclusive to the system. You can check out a full feature list below. - Test your platforming skills across 75 INKgeniously designed levels! - Jump, squish, slide and die to splatter brightly colored paint and uncover your surroundings! - Splat enemies, dodge missiles, and take down super-challenging bosses! - 20 deviously hidden coins to find and collect! As mentioned above, the game releases on 19th June, but players in Europe can pre-order the game now from the Nintendo Switch eShop. If you do, you'll be able to get a tasty 20% discount on the launch price taking it from £8.09 to £6.47. Do you like the look of this one? Will you be taking advantage of the pre-order discount? Let us know in the comments below. i feel like this won't be Inkcredible in Nintendo Life's review. but than again. i could be wrong. Super fun game, have had it on steam for a while now. Ill end up picking it up again. Looks great but now that I have Hollow Knight I think I'm going to be A LOT more selective with my purchases. Between HK, Fortnite, Paladins, and the mighty backlog I'm pretty good for a while. I'll be snagging the big ones and the usual indie here and there but I want to get some things finished. Looks like I’d be Inkcapable of pitting it down. OH! I liked this one very much! Glad to have it. sorry but it looks like an alpha build of a game before they added in all the sprites and textures. Kidding though, it does actually look nice, aside from the split screen.